BOSTON – Deeply personal stories – written from the heart — are the ones that will resonate with most theater-goers. And when you venture into territory that almost anyone could identify with — especially those in middle age or later, who make up a large chunk of the theater-going community — the stories will resonate even more. 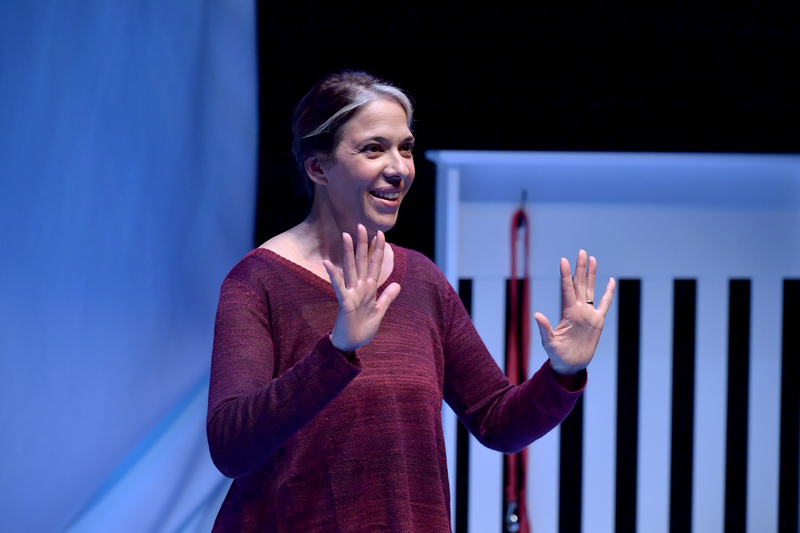 Melinda Lopez is an accomplished playwright (“Becoming Cuba,” “Sonia Flew”), actress (“Appropriate,” “The Mother***** With the Hat”) and teacher who has spread her gifts across the Boston theater scene for many years now. She is a proud Cuban-American, the daughter of Cuban emigres Manuel Lopez and Panchita Isidro, who left the island in 1959 after Fidel Castro took over, and that has flavored many of her works. Melinda Lopez, 52, was born in Cali, Columbia and came with her parents to Bedford when she was three, and her father worked as a mathematician and meteorologist for Mitre Corporation. In “Mala” she recounts the difficult last few years in the lives of her parents, including stories of her father’s decline and fall before his death in 2014, and the similar decline of her mother. After some tough times, her mother sailed into her late 80’s still driving, before suddenly declining in her early 90’s and passing away in 2015. Much of “Mala” takes place during the long and painful period when her mother’s health deteriorated and she refused treatment. Melinda Lopez cautions us that “everything needs a light touch” so instead of plunging us to depths of despair at every turn, she mixes humor – often black humor – with blunt, stark descriptions of the toll aging has taken on her parents – and her. “Mala” is not a weepy, sentimental piece; instead, there are times when the stress of being a care-giver becomes overwhelming and Lopez’s thinking becomes skewed. “She won’t rest until I am dead” is a thought that runs through her mind during her time caring for her mother. Re the title: “Mala” means “bad” in Spanish. It doesn’t necessarily mean the person has done something bad, but in their essence they are bad, and at one point her mother painfully labels her daughter as such. “Mala” speaks to many of us in the Baby Boomer generations. My father is 91, carefully and wonderfully cared for by all of our family members, but especially one sibling who has essentially put her life on hold while she spends most of her time with my father. That devotion has allowed him to stay in his home and out of a nursing home while his mind is seemingly as sharp as it ever was. For years before the death of my mother – who tap-danced into her 80’s before slowly succumbing to the ravages of Alzheimer’s Disease – my elderly father spent each and every day at the nursing home with her, and our family turned her nursing home into our home at holidays. “Mala” also talks about how the health and well-being of the primary care-giver is impacted, just as Melinda Lopez makes it no secret that she resented that she became the prime care-giver for her parents while scientist sister Mary was barely present. The hardest part of all, and a point that Lopez returns to again and again, is watching parents who were once so vibrant slowly decline and finally succumb to the ravages of time. ArtsEmerson Co-Artistic Director David Dower directed, and, working with a playwright who is already a gifted storyteller, undoubtedly helped her arrange her stories in the 80-minute piece (without an intermission) for the maximum impact. Scenic designer Kristine Holmes used three large sheets hung at the back of the set, to project text, interpretations of Spanish when Lopez decides to use it, or to convey the names of different scenes. For writers, simply talking about and retelling the stories of the loss of a loved one is therapeutic, and often a form of grieving. When my wife died suddenly years ago, writing about her and my feelings was a form of continuing therapy. Lopez, in retelling her own story and the stories of her beloved parents so passionately and keenly, has reminded us once again that aging and death are a struggle we will all eventually share, a part of the human condition, and the journey towards the end of life is one taken by every member of that family. The ArtsEmerson production of Melinda Lopez’s “Mala.” Directed by David Dower. At the Jackie Liebergott Black Box Theatre at the Emerson/Paramount Center through Nov. 20. artsemerson.org.